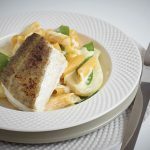 This deliciously light and fresh recipe is a great way to show fennel haters the light as the distinctive flavour pairs perfectly with the creamy sauce and saltiness of the fish. Slice the fennel, dice the garlic and put them into a large pan with the mangetout, orange juice and half the butter. Cook gently until almost cooked, then remove from the heat. Melt the remaining butter in an ovenproof dish. Turn the cod in the butter, then cook it skin-side up, until the skin starts to crisp, about 8 minutes. Meanwhile, bring a large pan of salted water to a rapid boil and cook the pasta according to the instructions. Drain, then add to the vegetable pan. Return the pan to the heat and stir in the cream, salt and pepper. 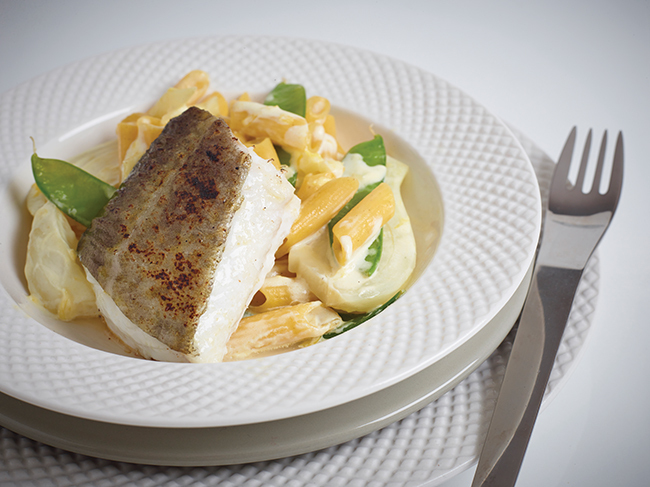 Serve the pasta with the roast cod on top.